If you’ve read any of my post before and from the name of my blog, you can probably guess I’m quite keen on encouraging twindividuality. For me and my girls, I think it’s really important to develop them as individuals and therefore encourage some time apart. This is definitely more easily said than done and 1:1 time with twins is certainly something I aspire to do more of. As twins, where they gain in having a special sibling bond, they often lose out on any real alone time with parents. Whereas most singletons will have had at least a little devoted time, twins are less likely to. However, even a few minutes here and there is better than nothing. Over the last year, I’ve made an extra effort to try and carve out some 1:1 time with Jessica and Emily and they thrive on it. Alone time also allows the girls to develop a tighter bond with Daddy too especially when they have him all to themselves. In our house, breakfast is quite a casual affair. Sometimes we sit at the little table and sometimes at the big table. Often one will be hungrier than the other and so I’ll excuse one to go play whilst I sit and chat to the other. This might only be five minutes but it’s nice to talk about our plans for the day without interruption. If your pair are anything like mine, one likes to get dressed and the other would live in their pyjamas. This means every morning Emily will follow me upstairs after breakfast and we can can have a little time alone before I call up Jess to get dressed. Finding their separate preferences can be a great way to get 1:1 time. As much as chores are often slower with a child’s help, I definitely believe in starting them young. When one or another shows an interest in helping out, I’ll take them upstairs to sort some washing or make a bed. Not only are they getting a bit a quality time alone with me, but often they are learning how to do something new too. Over the weekend either Daddy or I will go shopping. Emily has taken to going with Daddy leaving me home alone with Jess. She absolutely love this time. We read stories and play games just the two of us. I know Emily loves 1:1 time with Daddy as well and shopping with one, as opposed to two, is so much easier. I’m lucky enough to live near family and so we will often meet up. When there are lots more people around, Jessica and Emily will often separate and take advantage of the extra attention. Maybe one will get a story whilst the other is playing a game with someone else. We have a very repetative bedtime routine and after the girls have said goodnight to the sunshine on their groclock, they get tuck in time. This is just a few minutes each with Mummy and Daddy. It’s short and sweet but is a calming way to end the day and make them feel a little bit special. When the girls were tiny, it was almost impossible to get 1:1 time and now it’s still not easy. Even if I can only do a few minutes a day, I think it’s something that is important enough to prioritise. 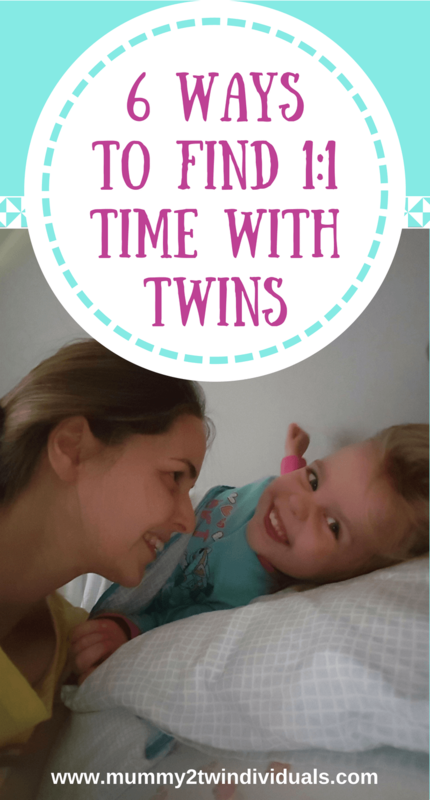 I’d love to hear how you get any alone time with each twin.